Welcome to our new feature! I'm going to try to post frequent short tech articles on questions that we get asked by customers about product installation, troubleshooting common issues, and general maintenance items. This issue I would like to go over a part that seems to give people a lot of trouble, the track bar. This seemingly harmless yard long piece of steel is the source of many death wobble and loose steering problems, not to mention those mystery clunks in the night. There are two root causes to most track bar problems (other than joints that are just flat worn out) so let's go over them. 1. Jam nut on the track bar loose. Sometimes getting the jam nut on your track bar tight can seem like an impossible proposition. Don't let this little sucker get the best of you! This is one nut that you can use a big cheater bar on, because the minimum torque spec is 150ft-lbs. You can go much higher, so don't be afraid to really employ some leverage on this one. Some track bars use a high clearance nut that barely has any flats ground into it, for those I recommend a pipe wrench and a cheater pipe. You can clamp the free end of your track bar into a vice, or a press, or you can pin it into your receiver hitch. 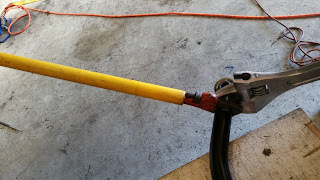 You can also pin it into the track bar mount and let the bar stick out through the wheel well so you can let it rest on your knee while you tighten the heim or Johnny Joint end. Don't forget the thread locker. 2. Track bar bushings loose or prematurely wearing out. The first questions I always ask someone that tells me that their new track bar's bushing end has excessive play is: "What size track bar bolts do you have, and what did you torque them to?" If you can't answer those two questions, you probably didn't use torque wrench, and the bolt probably isn't tight enough. If you drive your truck with a loose track bar bolt, you can destroy your brand new track bar bushing in just a few miles. Please invest in a torque wrench! The second common failure is not greasing the crush sleeve before installing it into the bushing. The grease fitting on the track bar does not do a very good job of lubing the crush sleeve, you are much better off taking the sleeve out once in a while and greasing it by hand. If you do choose to leave it in and grease via the zerk, loosen the bolt, grease, then retighten using your torque wrench! If you want to eliminate the bushing fiasco altogether, we offer a Carli track bar that does not utilize the two piece bushing at the frame like most other adjustable track bars for Dodge trucks. Thanks for tuning in, there are plenty more to come. If you have something you would like me to address in an upcoming article, post in the comments section.